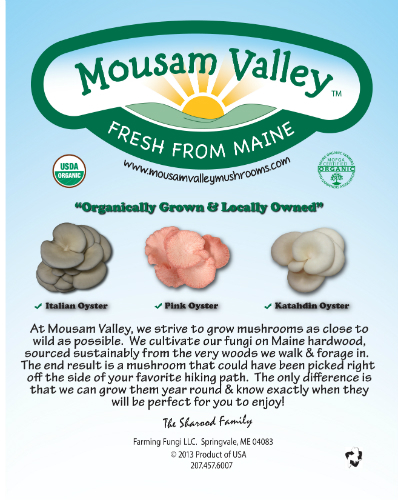 Mousam Valley Mushrooms is a family owned company, based in Springvale, ME located off of the Mousam River. We farm a variety of certified organic culinary mushrooms. We use proprietary, fully automated, growing technology and grow ""recipes"" to produce consistently superior native Maine mushrooms as well as exotic varieties grown on organic Maine hardwoods and straw. At farm (call ahead). You can find our product in your local Hannaford or Whole Foods Market. We also sell through the following distributors: Native Maine, Sysco, and Alber'ts Organics. We will also be in Shaws Supermarkets and Market Basket by March 2017! A variety of organic gourmet mushrooms including: Italian Oysters, Pink Oysters, Butter Oysters, our wild strain of Katahdin Oysters, King Oysters, Shiitake, Lion's Mane, Cinnamon Caps, Pioppino, and Maitake. Our spent mushroom substrate (SMS) is a by-product of our mushroom production and can be used for bioremediation. land restoration, plant disease control, organic fertilizer, mulch, soil-less growth medium, and as a soil conditioner.